The past two months have been very difficult for Santa Barbara, especially in Montecito, a community Giffin & Crane has been part of for more than 30 years. In December, the Thomas Fire — California’s largest wildfire in recorded history — ravaged the steep coastal mountains above Montecito, stripping the canyons of vegetation and destabilizing several square miles of boulder-filled watershed. A few weeks later, in the early morning hours of January 9, 2018, a powerful rainstorm turned Montecito’s canyons and creeks into torrents of mud, boulders, and uprooted trees. The destruction was catastrophic — dozens of homes were destroyed, hundreds were damaged, and 21 people were fatally injured. To everybody in the wake of the devastation, we extend our deepest condolences and all of our strength and patience in the months and years of rebuilding to come. And to every first responder: We say thank you. 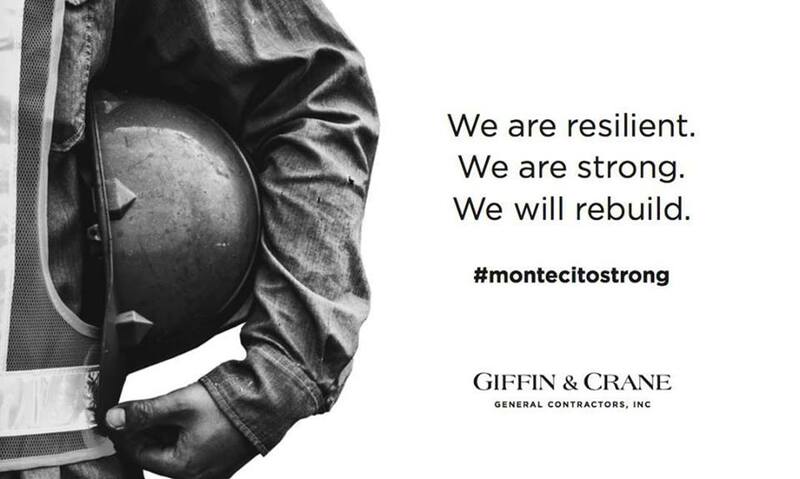 The majority of our clients live in Montecito, and in the immediate aftermath of the storm, we worried about their safety and whereabouts. With great relief, we soon learned that all of them survived the flooding. A handful, however, lost their homes. As custom homebuilders, we understand that very house and its surrounding property is a very personal, one-of-kind extension of the families who brought us aboard to help build their dreams. We’re very proud to be part of those projects, and we’re determined to help rebuild this very special community.